Lockheed Martin's reusable craft could take four astronauts to the lunar surface for missions lasting up to two weeks. Before humans venture to Mars, NASA wants to send astronauts back to the moon — and aerospace giant Lockheed Martin has developed a new lunar lander concept designed to shuttle space flyers between a moon-orbiting space station and the cratered surface below. Unveiled Oct. 3 at an international space conference in Bremen, Germany, the reusable lander would launch into space aboard NASA’s next-generation Space Launch System rocket and dock with the agency’s proposed Lunar Orbital Platform-Gateway. This planned outpost is a small moon-orbiting space station that NASA aims to build in the 2020s to serve as a way station for missions to the moon, as well as Mars and other deep-space destinations. 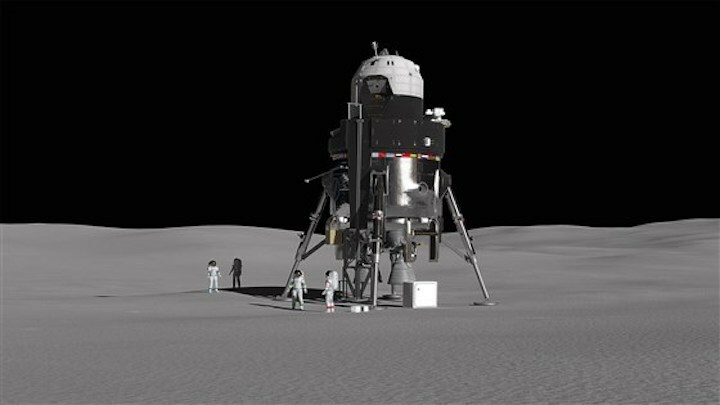 Lockheed’s lander would be able to carry a four-person crew and 2,000 pounds of cargo on lunar expeditions lasting up to two weeks — capabilities that far outstrip those of the Apollo-era "lunar modules," said Tim Cichan, a space exploration architect at Lockheed Martin Space Systems in Denver. Those single-use crafts carried two crew members to the moon for visits of less than a week — less than a single day in the case of the Apollo 11 astronauts, who were the first humans to set foot on the lunar surface. “What is exciting and innovative is that these are reusable, unlike what we had during Apollo,” Jack Burns, a professor of astrophysics at the University of Colorado, Boulder, said of the concept in an email to NBC News MACH. “The landers come down to the surface, potentially refuel using hydrogen and oxygen mined from water at the lunar poles and return to the Gateway." Since the lander would depart for the moon from the Gateway, it would be able to reach any region of the lunar surface — including the poles, where scientists have found evidence of water ice, Cichan said. That wasn’t possible with the Apollo-era landers, which were coming directly from Earth and were limited to landing sites along the moon's equator. In addition to allowing more extensive exploration of the moon, the upcoming lunar missions would make it possible to test technologies and systems that one day could be used to take humans to Mars. “Before we send crews on a three-year round trip, we want to test out that capability while we’re still relatively close to home,” said Tony Antonelli, director of advanced programs at Lockheed Martin and a former NASA astronaut. Lockheed Martin isn’t the only company with its sights set on the moon. Last week, Jeff Bezos’ aerospace company, Blue Origin, announced that it is designing a reusable lunar lander of its own. Blue Origin said its lander is part of the company’s goal of expanding civilization beyond the confines of Earth, with millions of people eventually living and working in space.